The South African War of 1899–1902, often called the Boer War (sometimes the Second Boer War), was the first overseas conflict to involve New Zealand troops. 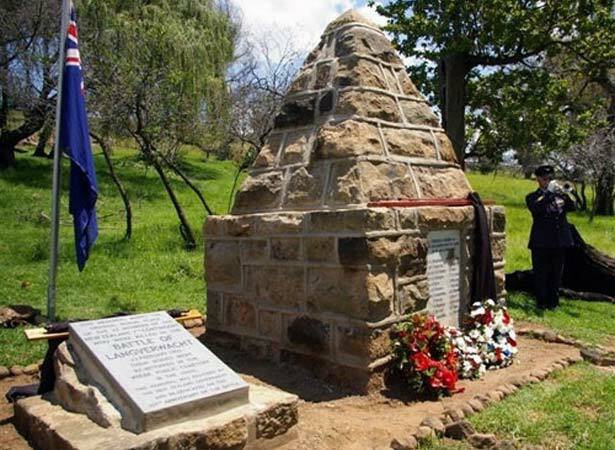 Fought between the British Empire and the South African Republic (Transvaal) and its Orange Free State ally, it was the culmination of long-standing tensions in southern Africa. Bound to the ‘Mother country’ by the ‘crimson tie’ of empire, New Zealand sent more than 6500 volunteers and 8000 horses to South Africa. In all, 71 members of the 10 ‘contingents’ were killed in action or died of wounds; 26 were accidentally killed, and 133 died of disease (more than half from typhoid fever). At Langverwacht Hill, near the Orange River, a Boer force broke through a British cordon at a point on the line held by New Zealand’s Seventh Contingent. The New Zealand line consisted of small posts of five or six men in shallow trenches (sangars). A small group of Boers drove a herd of cattle against the wire entanglements connecting the British blockhouses and used this distraction to overwhelm one of the New Zealand posts. They then advanced up the hill, destroying a number of other New Zealand-held posts. After ferocious close-quarter fighting, the Boers opened a gap through which most of their force escaped. The New Zealand casualties were high: of about 90 men in the front line, 23 were killed and more than 40 wounded. The 1 March 1902 issue of Christchurch’s Star newspaper, under the heading of ‘The Gallant Seventh’, acknowledged ‘a feeling of general sadness’. But it went on to add that ‘we can’t make cakes without breaking eggs. After all, the same number might soon have filtered away, one by one, the victims of enteric [typhoid fever]. These have at least had a chance to leave a glorious name, and they have done it’. Despite the setback at Langverwacht, the New Zealanders ‘displayed great gallantry and resolution’. Throughout the war the New Zealand contingents were highly regarded. The Times history of the war in South Africa judged that once they had gained some experience, the New Zealanders were ‘on average the best mounted troops in South Africa’. We have 5 biographies, 3 articles, related to End of the battle of Langverwacht Hill.